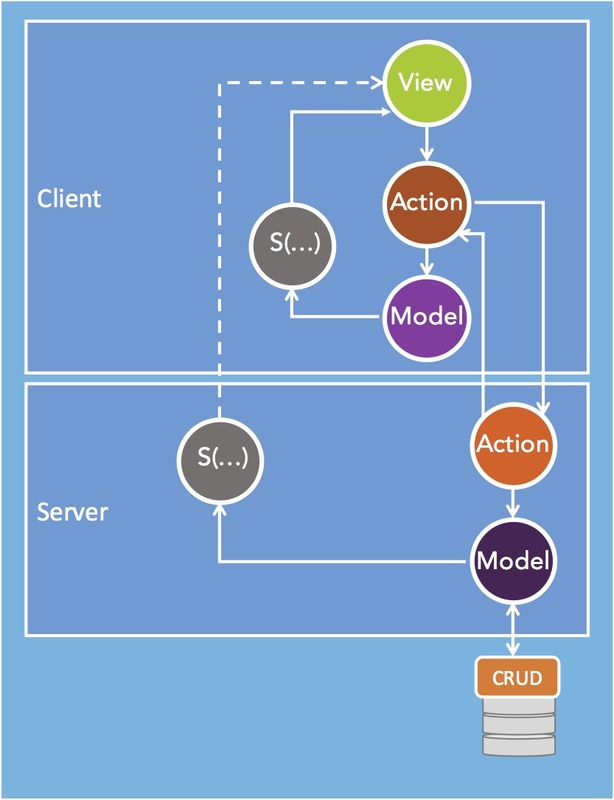 SAM (State-Action-Model) is a software engineering pattern that helps manage and reason about the application state. SAM's founding principle is that State Mutation must be a first class citizen of the programming model. SAM is unapologetically driven by simplicity and does not require any library or framework. Having mashed up our own implementation of the SAM Pattern made it even more interesting, as we’ve won significant flexibility and speed in development, allowing us to gain more on what capitalize on the most at the engineering team, Developer Time. This has allowed us to focus more on our business needs and less on bugs, but more importantly, It has enabled us to have the necessary time to craft our software with care and smoothness, so that we can deliver maximum value to our clients. You want to see some code? Take a look at the Fishing Game (index.html) here which you can run here. Where can I can find more information? SAM is built on one of the most robust foundation of computer science (TLA+). 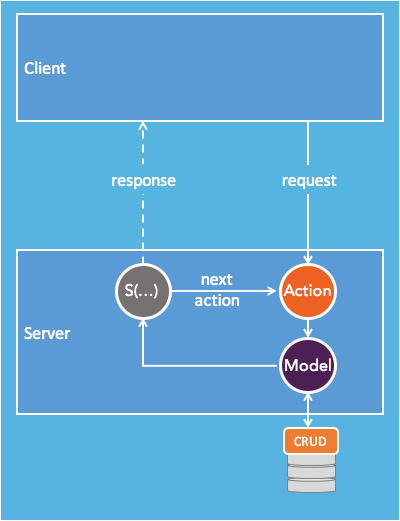 Every event is processed as “step” which involves this reactive propose/accept/learn flow. That's it! That's all there is to SAM. The pattern is best implemented with the model as a single state tree and a unidirectional data flow. In the case of Front-End applications, SAM is best implemented when the view is a pure function of the State Representation. Two-way data binding is strictly prohibited as it would entail uncontrolled model mutations. The pattern forms a reactive loop: events trigger actions which present data to the model, which computes the state representation. The reactive flow forms a natural step and after every step a new "state representation" is created (as a pure function of the model). As we show in many samples below, the view can be implemented as a series of stateless components which have no knowledge of the model or even the actions. When learning SAM in the context of Front-End applications, the best starting point is to understand the functional relationship between the view and the model. SAM suggests decomposing the view as a series of pure functions that are fed with the properties of the State Representation. With SAM, front-end developers can focus on building the view directly from the State Representation, unencumbered from the underpinning APIs. How the we got to the current State Representation is irrelevant. This is the paradigm shift that React introduced in Front-End architectures. SAM does not always eliminate the need for interactions (request/responses), but it tends to keep a good balance between reactive and interactive modes. We get a fair amount of questions asking "why not use templates"? The reason is simple: templates are interpreters while functions are mini-code generators. Interpreters are limited in what they enable you to express (not to mention you often have to learn a specific syntax that does not translate at all to another template interpreter). On the other hand, code generators are infinitely flexible with hardly any drawback. I would personally choose functions over templates any day. SAM allows you to choose the framework of your choice including none, but when using a Vanilla.js implementation, you need to make sure you mitigate the risks of cross-site-scripting. A couple of promising libraries have appeared recently (hyperHTML, lit-html and yalla.js) that offer support a "Functional HTML" approach. They, of course, are particularly good fit for the SAM Pattern. Not only SAM supports a functional structure for the View, but SAM enables a complete decoupling of the application logic from the View components. If you are not convinced you can look at this vanilla.js TODO sample and the "theme" section. If you are interested in learning about TLA+, I found Stephan Merz's course the most approachable introduction to TLA+. TLA+ offers a uniform language where Mathematics form the basis for description and analysis of reactive and distributed systems. The key paradigm shift is that no programming language today support any "temporal" constructs. Making programming much more difficult and error prone than it ought to be. TLA defines two levels of syntax: action formulas and temporal formulas. TLA+ also includes concepts such as safety (something bad should never happen) and liveness (something good eventually happens). In SAM, the business logic is decomposed in three elements: Actions, the Model and the State. Please refer to Section 2 of this paper from Dr. Lamport for a discussion on State-Action behavior. In essence the Paxos protocol roles are exactly the roles of the SAM components: Actions propose values to the Model, which accepts them, which the State accesses (the Learner) to create the State Representation (which is displayed by the View). I personally like SAM because it surfaces the concept of "State-Action" behavior, which is at the core of SAM, and leads naturally to creating the "State Representation" (i.e. the View). So, for all intent and purposes, please be warned that SAM's Model is the assignment of values to all possible variables of the application state, while SAM's State (representation), which is sometimes contains the "control state" (such as "started" and "stopped" are two control states of a car), refers to a function that computes the current state representation and control state of the system. In general, the "State" of a system controls which actions are allowed at any given point in time. The decoupling State/Model supports a multiplicity of state functions (such as a car with a beginner or experienced modes). Actions are functions which translate an event into a proposal which contains the values we want the model to accept. There is nothing else to it. In Redux for instance, "actions" are a data structure, which are a lot closer to an intent or event than an action. This is a fundamental difference between Redux and SAM because in Redux the reducer creates an unnecessary and unwanted coupling between the model mutations and the logic that translates intents into model property values. Actions typically implement context specific logic. If we take the example of a "change of address" action, we might implement some context specific rules, such as when there is no country specified in the input dataset, the default country is Australia, while the model is responsible for the integrity of a customer address which requires a country value. Actions play another important role with respect to invoking 3rd party APIs. For instance, we can define an action which will invoke a 3rd party validation service, which given an address, returns the postal address (or an error). It is then the postal address which is presented to the model. Actions are typically highly reusable across models, and we could even imagine some companies starting offering SAM actions following a SaaS model. A "change of address" action, which returns a postal address given user data is highly reusable, across many businesses. The model is a singleton that contains all the application state and (logically) exposes a single method: present(proposal). The model is responsible for accepting (or rejecting) the effects of an action. The model is where integrity rules get enforced. In other words, actions are generally triggered with some context specific data, they do not have access to the application state, for instance, when you implement a "change password" action, the action will check if the password is valid in the context of the request, but the model might enforce additional integrity rules, such that you cannot use a password that matches any of your last three passwords. Depending on the number of control states of your application and the size of your model, these functions can become rather tedious to write. Again, there is no requirement to adopt such an approach, it may help in some cases and be a burden in others where a series of if-then-else on some key properties of the model would be good enough. Once the state representation is rendered, the State function is responsible for invoking the next-action predicate (nap), which is a function of the model. The purpose of the nap() function is to determine if, given the current control state of the model, there are some automatic actions that need to be invoked. For instance in the Rocket Launcher example, the "decrement()" action is invoked by the next-action predicate while the system is in the counting state. When the counter reaches zero, it invokes the "launch()" action. When you feel that a full state machine is required for your app, you may use a library such as the STAR library. In Front-End applications, the State Representation is typically rendered as part of the reactive loop, however, in the most general sense, the state representation is published to consumers (i.e. Learners in Paxos). Formulating the View as a series of pure functions of the state representation work well. The concept could also be extended to map the event format to be directly consumable by the action, but this coupling is less important than the coupling of the actions with the view. However, that expression is only a logical expression that describes the sequence in which the elements of the pattern are invoked. The expression itself is not representative of the Reactive Flow or the different wiring options. SAM can be implemented in the browser (like React and Redux), but one of SAM's advantages is that the elements of the pattern can be distributed and composed in virtually any topology. So there is not a single way to wire the pattern. 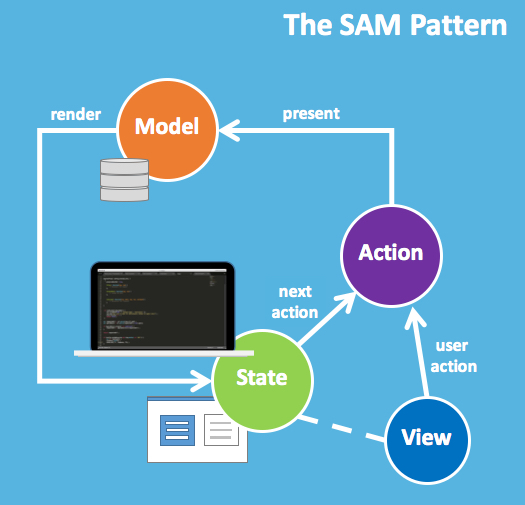 You should also keep in mind that SAM is a reactive pattern so there is never a response that is expected: The view triggers an action, which presents its proposal to the model, which asks the state to create a state representation, which is rendered by the view and displayed in the browser. SAM could also be used with an interactive wiring where a request is wired to an action and the state representation becomes the response to the request. Let's start with a sample where running SAM exclusively in a single process (e.g. the browser, perhaps assuming the model will communicate with a persistent store). One can also use RxJS to wire events to actions. Attendees: " + state.reservations.join(", ") + "
Gunar Gessner has implemented a client-side "Time Travel" dev tool that enables you to take snapshots of the model after every action is processed and then restore the state of the system with a given snapshot. The SAFE container implements both a client-side and server-side "Time Travel" dev tool. The SAFE project (State-Action-Fabric-Element) is a micro-container for SAM implementations which can run in the browser or on node.js. At a minimum SAFE enables you to wire the elements of the pattern. It also comes with Session Management, Logging and Error Handling. The current version enables global validation and enforcement of actions, including action "hang back". Last but not least, it implements the Time Travel dev tool. The SAM pattern offers some generous composition mechanisms. This type of composition is a functional composition and the resulting action is considered to be a single action applied to the system from SAM's point of view. Logically you cannot compose Actions, as it would violate, the Action->Model->State step, you can only create "composite" actions. The most interesting composition mechanisms are at the pattern level itself. For instance, SAM supports an instance level composition where one instances runs in the browser and one instance runs in the server. Though it is theoretically possible, it is highly recommended to refrain from invoking client actions from the server. The role of the server is rather to deliver the SAM client instance as part of its state representation. Here is a Parent/Child sample using React 15.0.2 with JSX/Babel. It shows how you can implement a complex form of wizard with a child instance and submit the resulting dataset to the parent, once the content of the form is valid. SAM also offers an interesting alternative composition mechanism which enable to synchronize a client side and server side model, by which you present the same dataset to both the client side and server side model. and almost every object that computes is naturally viewed as a state machine. The tuples (Si,Aik,Sk) are merely an observation of the behavior of the state machine, rather than a physical representation of its runtime. This change of perspective (not semantics) is minute, yet fundamental. SAM would not work (as well) if the traditional semantics of State Machine would be structuring the code. The SAM semantics are inclusive of this traditional structure, and therefore strictly compatible, but SAM by no means require that one uses a graph of State and Actions. I believe that is why some people have expressed that SAM "feels natural". I cannot emphasize enough that it is not necessary to adopt a State Machine structure to use SAM and more often than not if-then-else will be adequate. However, sometimes it may become easier to use a strict State Machine structure. These functions can be used to validate that an action is enabled or not. They can also more naturally break down the hierarchy in from which the view is rendered. Similarly, the model can perform all the persistence operations (which could result in rejecting some proposed values) before passing control of the Reactive Loop to the State object. That is very different from React because you cannot touch the State without triggering a rendering of the view, which makes very little sense, when you think of it. It only makes sense when you spread the model state into the various components, and even then it warps the articulation of APIs with the Front-End reactive Flow. SAM can also be used without a View, whereby it listens on incoming Action requests and returns a response which can be the model of a fraction of the model. As such SAM offers a new API implementation pattern which is particularly well suited for implementating Stateful APIs. The pattern can easily be adapted to mount a user session in the model or rehydrate/dehydrate the context of the request before/after the model mutates. Option #1 should be preferred when authorization (RBAC) is a concern. Option #5 is the one that pushes as much processing on the client as possible. When concurrency is an issue, it's possible to use the "Bakery Algorithm", again using the work of Dr. Lamport. First, I would recommend getting familiar with the approach I call "functional HTML" perhaps starting with this article and its samples (which are not SAM based). If you are up to building something more substantial, you could download an HTML5 template of your choice and start building an application with it. To make this tutorial more realistic, we are going to build a simple Web Site with Blog and a Contact form. Snabbdom ( Jose Pedro Dias). You can run the sample here. André Statlz has written a great paper comparing the different Unidirectional User Interface Architectures. The pattern closest to SAM is Famous, but unfortunately, they mutate the model directly from the actions (events in Famous' terms) and they do not support a nap() function. The SAM pattern spans several libraries of the React.js nebula: React.js itself, but also Flux/Redux, including separate libraries such as Redux-Thunk and Redux-Saga. This framework (of libraries) has been built rather opportunistically, solving one problem at a time, without a coherent architecture. Further its architecture focuses heavily on the client, without much consideration for the server. Next action predicate (nap) is implemented as a Saga which couples many operations and generally relies on local state as shown in this implementation of the Rocket Launcher. The Next Action Predicate is a pure function of the model which computes the current (control) state of the system and derives the next-action. Redux combines the logic that computes the values with which you would update the model with the logic that decides whether the model accepts these values or not. As a corollary it couples the interface of the reducers to the model. One of the key roles of actions is to adapt the View-Model interface in ways that makes the model insensitive to the view semantics. The Reducers' interfaces are directly shapped by the view, which is an anti-pattern. Sagas are stateful by definition and their imperative style makes it difficult to reason about what is the next action that will occur. That being said, the deal breaker, for me, is the fact that Reducers cannot run on the server because of React's architecture. The store would need to be updated with the output of the root reducer, i.e. the entire state, which would create a high bandwidth, chatty interaction with the client. With all its imperfections, boilerplate and template language, Angular makes it easy to implement the SAM pattern, which in turn, I believe, adds a lot of value to Angular with a Single State Tree and the ability to control mutations outside the Angular components. SAM allows you to code your business logic coupletely decoupled from Angular itself. Vue.js is an increasingly popular framework for building modern Web applications. Just like React, the basic framework focuses (mostly) on the View and you need to select from another nebula of libraries when you need to build more robust applications. In this brief analysis, I will focus on vue.js only, as well as the vuex.js library which is a Redux-like state management library. Vue is template based and relies on two-way databinding which is a major step back in Front-End architectures. Jean-Jacques Dubray, InfoQ, Feb. 2016 "Why I no longer use MVC Frameworks?" Gunar Gessner, Jean-Jacques Dubray, InfoQ, Oct. 2016 "Lessons learned in implementing the SAM pattern"
Jean-Jacques Dubray, Marcus Feitoza, Sladan Ristic "Three Approximations You Should Never Use When Coding"
Jean-Jacques Dubray "HEX: A no framework approach to building modern Web Applications"
Alexander Schepanovski, March 2015 "Boiling React Down to a Few Lines in jQuery"
Simon Friis Vindum, "Functional Front-End Architectures"
Steven Lambert, "A proposal to improve the DOM creation API: HTML Tagged Templates"
Mike Samuel, "Using type inference to make web templates robust against XSS"
owasp.org "XSS (Cross Site Scripting) Prevention Cheat Sheet"
Greg Young, "CQRS and Event Sourcing"
SmartDraw "Why we ditched AngularJS" Hamza Houaghad "This is how we decided to do Frontend at Invisible"